On Saturday 9th February, former SA Unions Secretary, Joe Szakacs, was elected Labor MP for the by - election in the inner north-western suburban safe Labor seat of Cheltenham in Adelaide. The by-election arose after former Member for Cheltenham and former Labor Premier, Jay Weatherill, resigned from the SA Parliament following last year’s election of a Liberal government. Joe Szakacs received 58.8 % first preference votes with postal votes still to be counted. A local of the area, Joe said after the votes were counted that "...I'll be fighting for them (his electors) in the same way I've been fighting for working families for most of my life." He named his priorities as fighting against the SA Liberal Party Government's "cruel cuts to jobs, services and public transport." In his capacity as Secretary of SA Unions, Joe provided leadership to affiliated unions in campaigns against privatization and cuts to services by both the former Labor Weatherill SA Government and the current Liberal Government. InDaily, a local online news service described Joe Szakacs as a "thorn in the Premier's side " in reference to the former Premier Weatherill's love affair with a proposed nuclear waste dump in SA. Szakacs called Weatherill "tone deaf" when the latter called for a referendum to decide if the nuclear waste dump should go ahead. It was due to the active mass opposition to the proposed dump by Indigenous and non-Indigenous groups and unions under Joe Szakacs’ leadership as Secretary of SA Unions that the former Premier Weatherill dropped the whole idea of a nuclear waste dump. 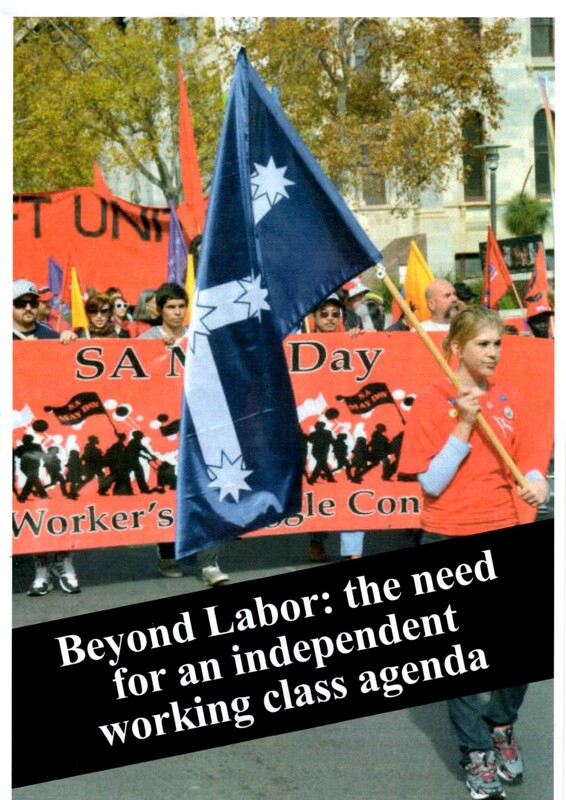 During Joe's leadership role at SA Unions, the position enabled him to contribute to building an independent working class agenda expressed in the SA Unions' "Build A Better Future" campaign and the more recent Australia wide union movement "Change The Rules" campaign. Now he will face the challenge that all "parliamentarians with the best intentions" who have risen to their position due to their participation and leadership within unions face. That challenge is to continue to contribute to the working class movement and struggle which inevitably will take a direction beyond the confines and restrictions of the bourgeois institution of parliament. This contradiction was blandly stated way back at the time of the strikes of the 1890s in Australia. The then President of the Railways Union in SA, W.F. Stock resigned his position as president because, "As a member of the House of Assembly I am representative of the people of all classes, and I should be violating the oath on entering Parliament were I to become an active partisan on either side of this great struggle" (quoted from "The Sound Of Trumpets, History of the Labor Movement In SA" by Jim Moss). The "great struggle" was and still is the class struggle between capital and labor. While we wish Joe well in continuing to be part of this struggle on the side unambiguously of the workers, but know that he faces an uphill battle. “The record shows that all Labor Governments essentially administer and serve the capitalist system and those who have economic, political and media power. They change nothing fundamentally, and have helped to run a system that has recently seen the greatest transfer of wealth from the majority to the rich minority in the history of this country” (“Beyond Labor: the need for an independent working class agenda” published by the SA State Committee of the CPA M-L April 2013). One thing is certain: the independent working class movement will not be channelled into the quicksand of parliament. It lives in the communities and workplaces of the people.